As one of the most iconic characters in the history of the medium, Mario seems to get more than a fair bit of stick for showing up in anything that isn’t a platformer or a kart racer. 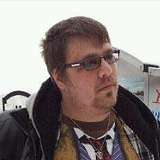 Over the years, the portly plumber has infiltrated practically every other genre going (although I’ve yet to see him in a Real-Time Strategy if you’re thinking of making one of those, Nintendo), but it’s when the Mushroom Kingdom’s saviour takes on the RPG that he really, truly begins to shine. Starting off with Super Mario RPG, Mario’s involvement with taking turns and hitting numbers out of people has branched out into the amazing Paper Mario series and its hand-held counterpart known as the Mario & Luigi series. Making its debut with Superstar Saga – to date still one of my favourite games ever – then branching out into time travel in its sequel and a more than fantastic voyage in Bowser’s Inside Story, Dream Team Bros marks one of the flagship releases for the Year of Luigi celebrations, and could easily take the mantle as the best title of the lot. Our journey starts when Mario, Luigi, and Princess Peach take a vacation to Pi’illo island and, rather than Mario being framed for spreading graffiti all over the island and being told to cleaning it up in a Kangaroo Court sentencing, it instead transpires that this is a land where people are able to visit other worlds via the dreams of others. As Luigi tries one of these out as a brief respite from all his tireless adventuring, Princess Peach is pulled into his dream world, and it’s up to our intrepid heroes to rescue her yet again. To this end, players must traverse the land of Pi’illo, the side-scrolling dream worlds, and take down anyone who tries to put a stop to their rescue plan. 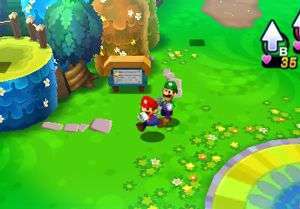 Exploring worlds in the Mario & Luigi series has always been about using the brothers’ abilities in tandem and, once again, Dream Team doesn’t disappoint. While there’s no difficult platforming in the main over-world – displayed to players in a top-down view with some tasty 3D environments – the only way to see everything there is to offer is by using the brothers’ unique skill-set to overcome obstacles in their environment. The series mainstay of hammering a brother underground to collect items below the surface remains, but there are some other moves to play with, most notably one that sends both brothers hurtling forward in a drilling motion in order to break apart any of the humongous boulders that block their path. It’s not just useful for rock-smashing, but it can be used to move across some of the larger gaps that the plumbers can’t quite reach in a single bound; one sequence involved the brothers having to use the drilling manoeuvre to reach a pipe that could then shoot them to another platform, allowing them to continue their journey. 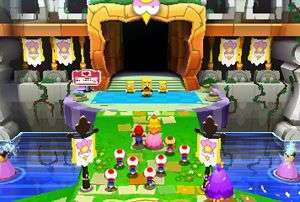 Those familiar with Bowser’s Inside Story will feel more at home during the dream-scape segments, as they’re presented in a side-on side-scrolling view. In that title, your actions would help Bowser progress in the real world as you would help his body perform feats it was otherwise incapable of, but this time around it’s your actions outside of Luigi’s body that will dictate how you progress inside his dream world. As you’re traversing the lucid landscapes, Luigi’s mug will be displayed prominently on the bottom screen, and players will have to use the touch-screen to interact with the sleepy plumber in order to alter his dreams. As it transpires, the green-clad brother’s representation inside these segments is actually a figment of his own imagination known as Dreamy Luigi, and by messing with the real deal you can alter the state of both his counterpart and his imaginary world in order to help your search for the elusive Princess. For example, pulling his moustache on the bottom screen allows you to stretch out a leaf which can then be used to fling Mario across to new areas. Much like previous titles, AlphaDream are making sure that moving through every environment feels original, even if the platforming has always taken a back-seat to the writing and the combat in this series. 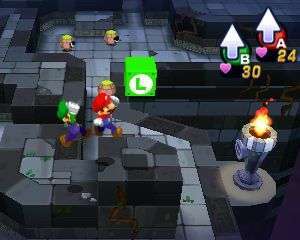 One of my favourite parts of playing the Mario & Luigi series has always been the turn-based battling; fights are initiated in the world rather than being random, allowing you to get a pre-emptive strike or get ambushed before conflict has even begun, every move from the brothers can be made more powerful by actively paying attention and hitting the attack button again at the right point, and with the right timing you can dodge and counter-attack against your opponents. 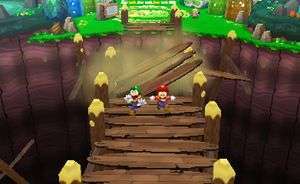 Throughout your journey, both plumbers will learn additional moves and attacks that can spice up the action, with these primarily taking place as Bros Moves, which vary in cost depending on how powerful they are, but allow more skilled players to maximise the amount of damage they can score against their foes in any one turn. In the standard world, these new moves included a skateboard that Luigi had to speed up, while Mario readied his hammer for the optimum time to strike against the enemy, and the familiar Koopa shells, which each brother would kick at their enemy while slowly closing in on them. This latter move also took advantage of the extra dimensions of the 3DS, which while optional did allow you to get the timing slightly more precise while pulling off the manoeuvre. More interesting was the fact that some enemies can turn the tables on you in a similar manner, with the demo boss encounter occasionally chasing Mario and Luigi towards the screen and the player making sure they jumped at the right time to avoid hitting any obstacles in the way. Every Mario & Luigi has found a way to iterate on the combat before it, and in Dream Team this is most evident in the battles within the dream-scape, as I discovered when Mario and the imaginary version of his brother took down series-familiar and previously-unwitting ally Bowser. With the events taking place inside Luigi’s dream, anything is possible, and in this circumstance it meant that Mario had access to a whole litany of new special moves, all of which take advantage of the unreality he finds himself within. The first of these is a move that allows Mario to ride a horde of Luigis, which must then be stacked onto multiple groups of the green plumber until you’re surfing on a makeshift tower of plumbers aiming to jump on top of your foe, with the move ending prematurely if the bundle of brothers collapses like a drunken game of Jenga. The other ability on display was one which again took advantage of the three-dimensional abilities of the hand-held, charging the red-clad brother to run on top of a ball constructed entirely of hundreds of Luigis, making sure to follow the path ahead of him that’ll allow him to accrue more copies of his hapless brother until the runaway sphere smacks into your enemy. Even defending has gone through a few changes while in the dream-scape, with Mario able to move freely around his side of the battle arena, allowing him to dodge out of the way more effectively rather than standing and jumping in place to avoid attacks. As Bowser unleashes a row of fireballs at his long-time rival, the player can now move him in-between the fireballs and out of danger until his enemy’s move is over, allowing for the long-running RPG elements in the series to become far more active and strategic than they were before with just a simple change. Those who remembered the climatic boss battles in the previous title – where Bowser would grow exponentially and force the hand-held to be rotated so his massive stature could take up the entirety of a temporarily-portrait screen – will be at home here, as Dreamy Luigi will sometimes be called to grow hundreds of times his original size to dispatch some of the more gigantic creatures that occupy his world. As in Bowser’s Inside Story, these fights are entirely controlled by the touch-screen, with jumping and hammering controlled by well-timed swipes and healing requiring the player to tap the screen rhythmically to devour enough mushrooms to recover from his injuries. With the battle eventually over, the only criticism I can level at any of the fights I engaged in was that the touch-screen-only conflict felt like it went on for a few turns more than was necessary, especially considering its slower pace – the normal-sized bros could probably finish a couple of moves in the time it takes to pull off one of mega-Luigi’s. That aside, from what I saw there’s no doubt in my mind that Dream Team Bros could be the ultimate Mario & Luigi title. The combat’s been refined, made deeper and more frantic without sacrificing any of the strategy or spirit that made it so revered in the first place. 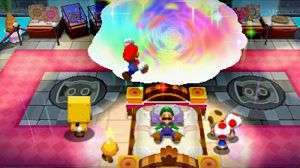 Exploring Luigi’s dreams feels like it’s going to be full of imaginative and brilliant sequences, and knowing the often-hilarious writing AlphaDream are known for, I can’t wait to see what they have hidden up their sleeves. It’s hilarious, smart, incredibly fun to play and it’s not afraid to put Luigi into the spotlight in the most imaginative way possible; let’s hope it doesn’t all turn out to be a dream. This is one of my to buy on release day games… I am totally not regretting buying a 3DS!